As the pictures suggest, the fountain consists of a sheet of water moving as if it were the page of a book being turned. I rather like that idea. I didn’t notice it at the time, but I have since discovered that two venerable Hungarian universities, Eötvös Loránd University and Péter Pázmány Catholic University, both of whose foundations reach back to the 1600’s, are located across the street from the fountain. 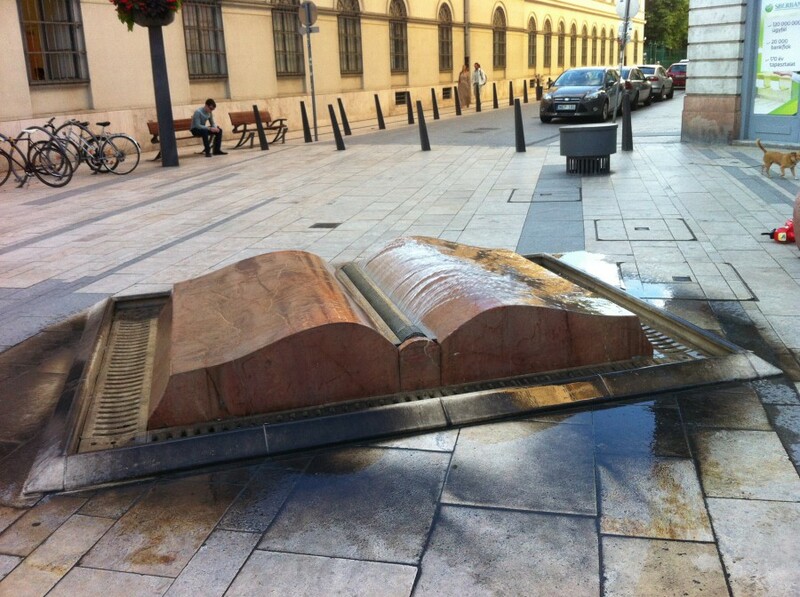 I would guess that the fountain is linked to them: aren’t Universities places which revere books? 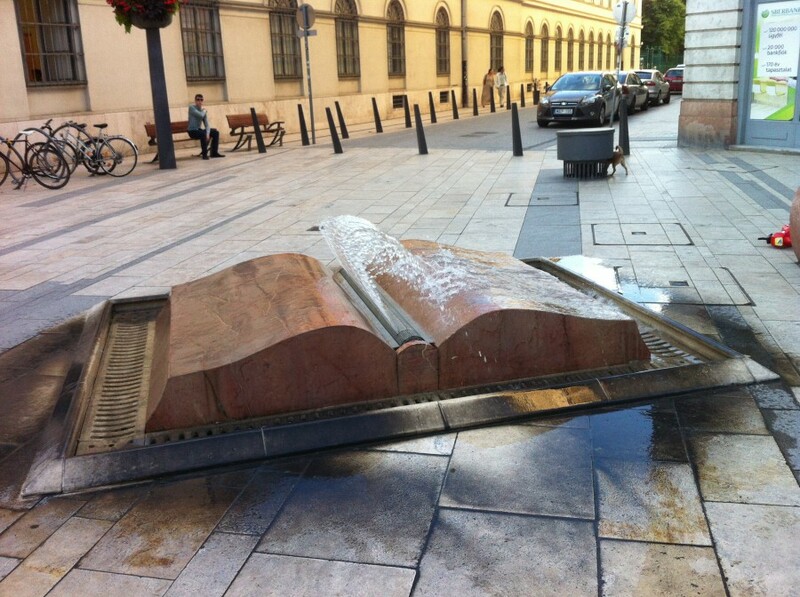 Maybe the fountain is telling us that books water our intellectual life. But that’s a bit too fanciful, perhaps. 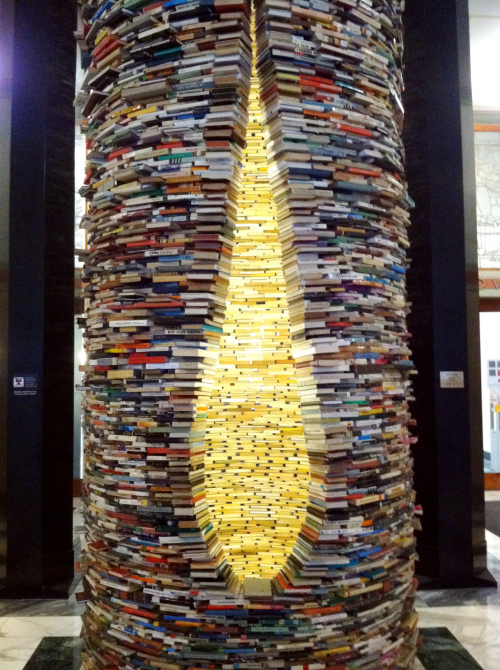 My curiosity piqued, I started looking around for pictures of other sculptures where books play the lead role. And of course someone has already helpfully put together a gallery of such photos! It’s on a site called Book Riot, which promotes reading of book reading and writing about them, my kind of site. I have shamelessly lifted a number of their photos to put here. Most of them have obvious connections to book-related institutions. Here is another, a little bit more untidy and making the connection between books and children (which perhaps explains the untidiness of the stacking?). 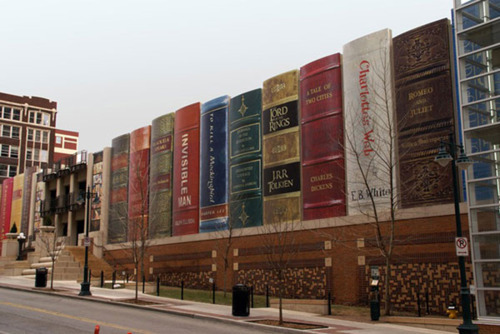 It adorns the public library in Coshocton, which is (and I had to look this up on Google Maps) in Ohio. 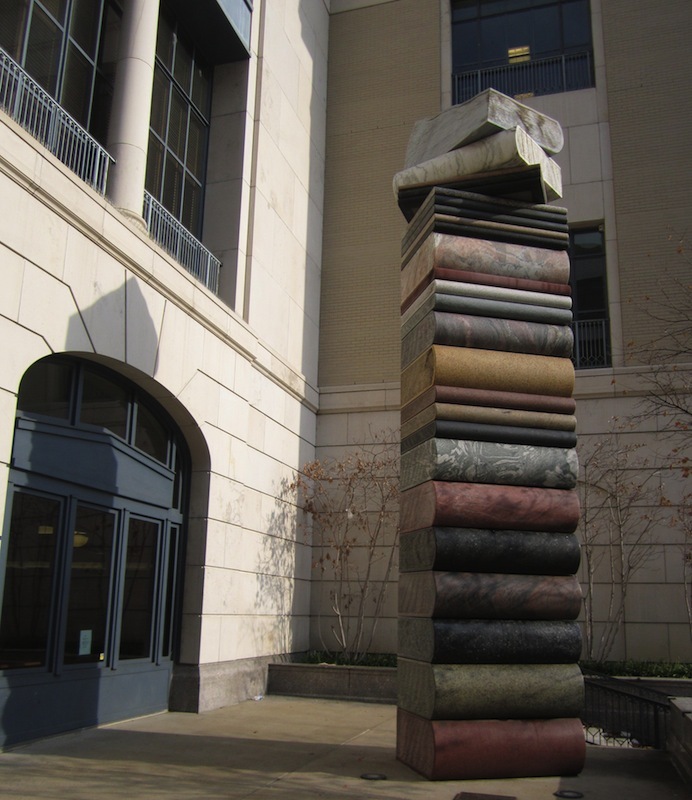 The sculpture is composed of 100 books, each one representing one year of the library’s service to the community. Here is another stack of books, this time from Berlin. This particular sculpture no longer exists, alas. It was part of a set of six sculptures celebrating the football World Cup of 2006. After a few months, they were taken away, who knows where to. 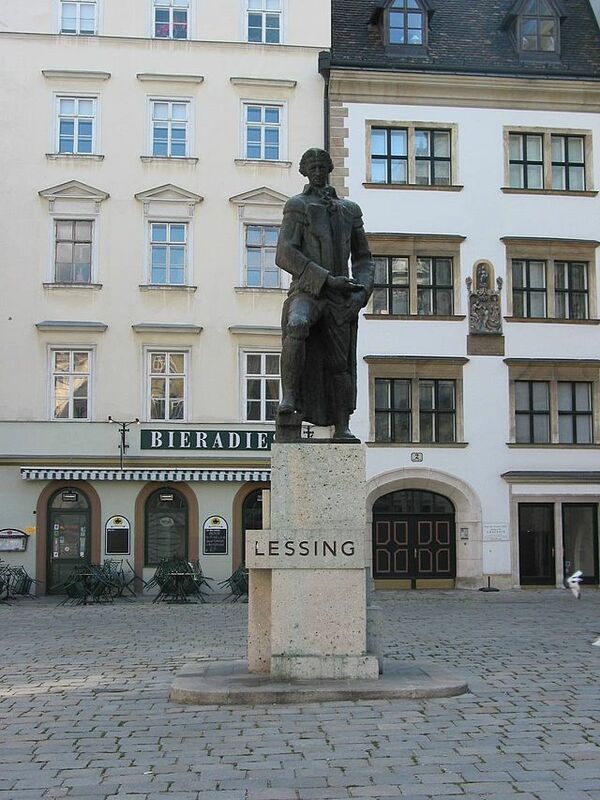 This particular sculpture, set up in Bebelplatz opposite Humboldt University, celebrated Johannes Gutenberg who invented the modern letterpress in the German city of Mainz in around 1450. The stacking motif continues with this sculpture, although a spiraling twist has been given to the whole. 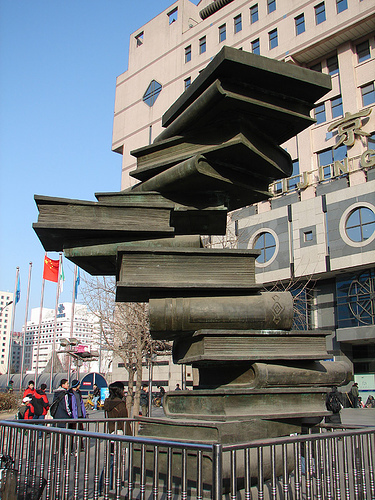 The sculpture is in front of Beijing’s Xinhua bookstore, although I must confess to never having noticed it. 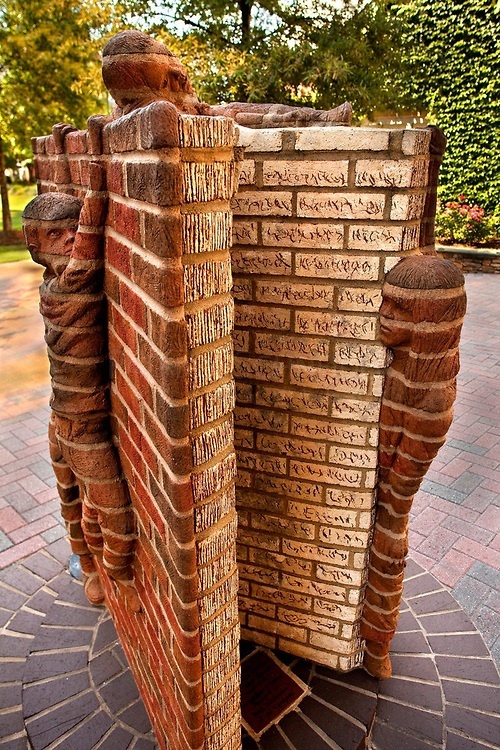 Here, the stacking has turned into a triumphal arch, located in Atlanta, at Georgia State University. This is a very obviously symbolic statue. It was created by the sculpture students at the University and is entitled “No Goal Is Too High If We Climb With Care And Confidence”. A visual metaphor dear to the hearts of many a University Professor, I’m sure. This one, from Charlotte North Carolina, is quite different. 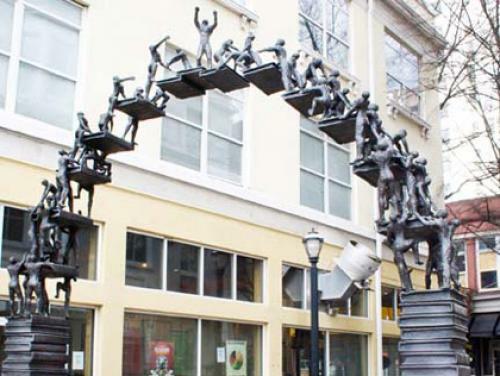 Like the sculpture in Coshocton, it makes a connection between books and children, but here it becomes equivalent to playground equipment, showing books as something for children to play with, on, in. I’ve not seen it, but I read that if you look inside you get the impression of an infinite tower. It seems that Kren has made clever use of mirrors to get this optical effect. The last could easily be an old farm house in southern Europe somewhere. 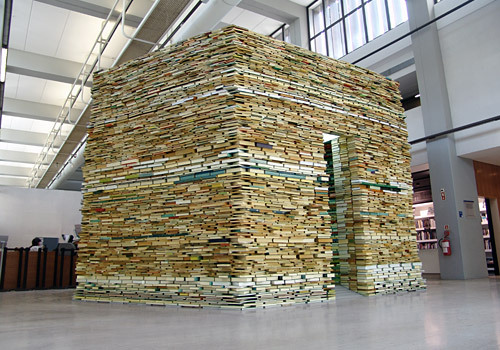 The following site shows a couple more such structures made with books by Kren and other artists. 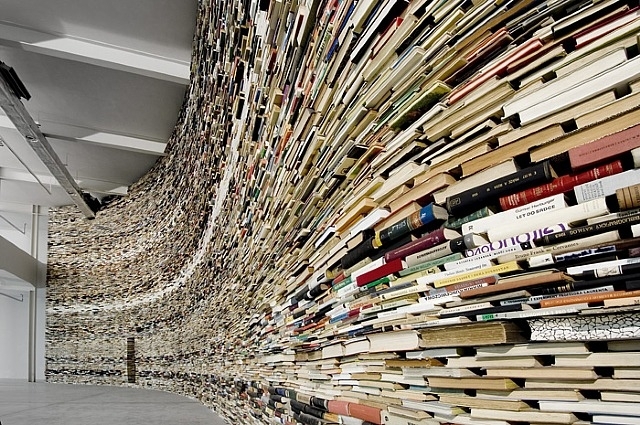 This last photo brings me to another structure made with books, but of an altogether darker tenor. 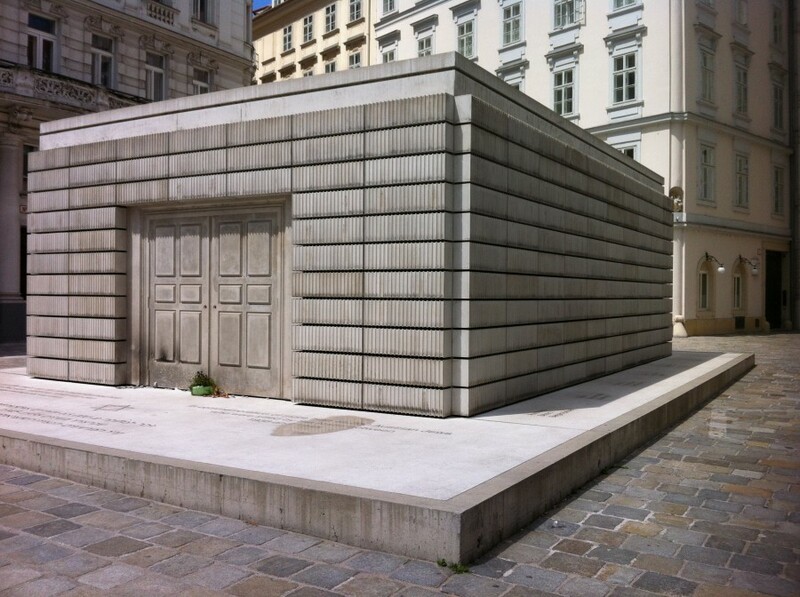 It is the Holocaust memorial in Judenplatz, Vienna, a memorial to the more than 65,000 Austrian Jews killed by the Nazis before and during World War II. On my way back from Budapest to Beijing through Vienna, and with the book fountain still fresh in my mind, I decided on the spur of the moment to quickly revisit the memorial before boarding the bus for the airport. From far away, it looks like one of those squat, windowless blockhouses which dotted the battlefields of World War II. But when you get closer, you see something else. 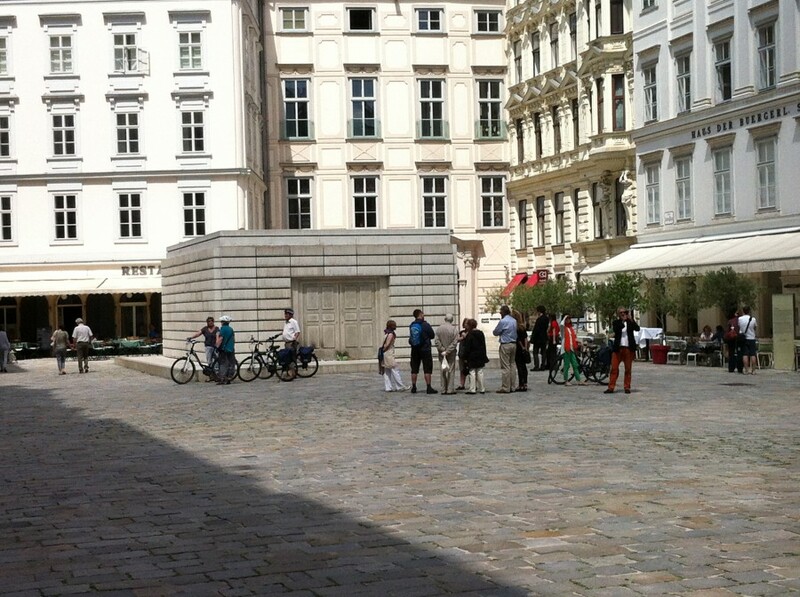 At the other end of Judenplatz is a statue of the writer Lessing, staring so it seems at the Holocaust memorial. “The era of extreme Jewish intellectualism is now at an end. The breakthrough of the German revolution has again cleared the way on the German path…The future German man will not just be a man of books, but a man of character. It is to this end that we want to educate you. As a young person, to already have the courage to face the pitiless glare, to overcome the fear of death, and to regain respect for death – this is the task of this young generation. And thus you do well in this midnight hour to commit to the flames the evil spirit of the past. This is a strong, great and symbolic deed – a deed which should document the following for the world to know – Here the intellectual foundation of the November Republic is sinking to the ground, but from this wreckage the phoenix of a new spirit will triumphantly rise. Then the students joyfully threw the books onto the pyre, with band-playing, songs, “fire oaths”, and incantations. 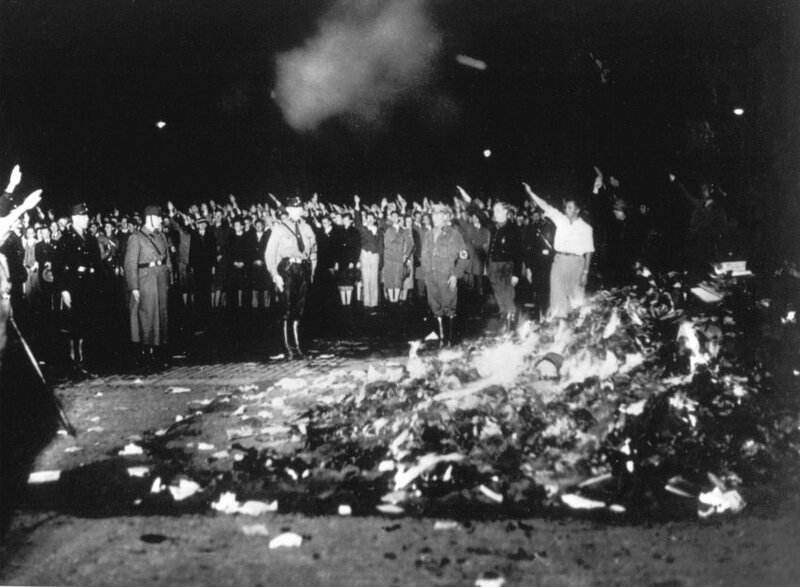 In Berlin, some 20,000 books were burned. 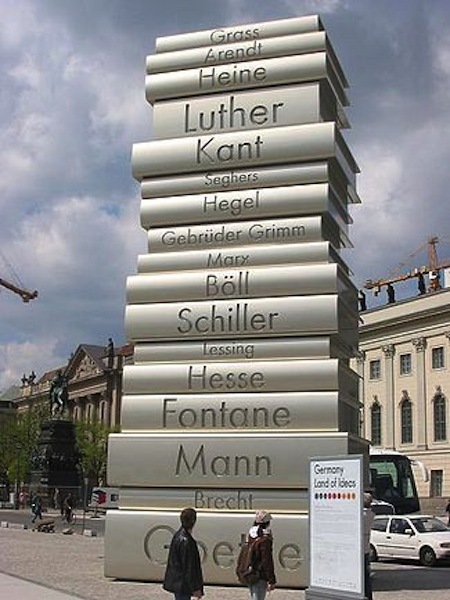 Looking back at the stack of books which make up the sculpture put in this same square 83 years later, Heinrich Heine’s books were burned, as were those of Anna Seghers, Karl Marx, Heinrich Mann, and Bertolt Brecht. 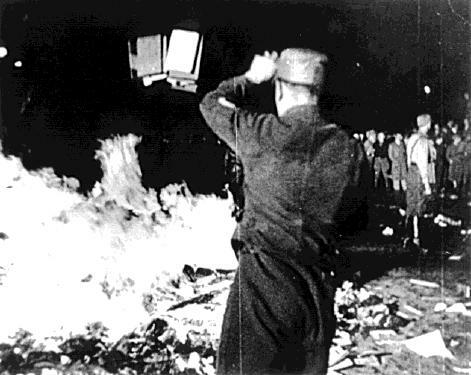 In all, the works of some 60 German authors and 25 non-German authors were consigned to the flames. 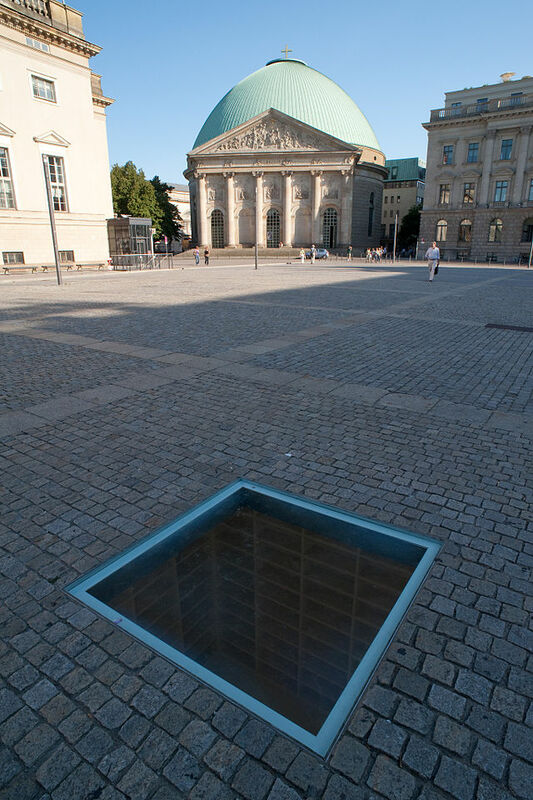 The memorial to this shameful episode consists simply of a glass plate set into the square’s cobble stones, below which are visible empty bookcases, enough of them to hold the total of the 20,000 burned books. Next to it is a plaque, with a line from Heinrich Heine’s 1821 play Almansor: “That was only a prelude; where they burn books, they will in the end also burn people.” Heine was referring to the burning of the Muslim Quran by the Christian Inquisition in Spain. 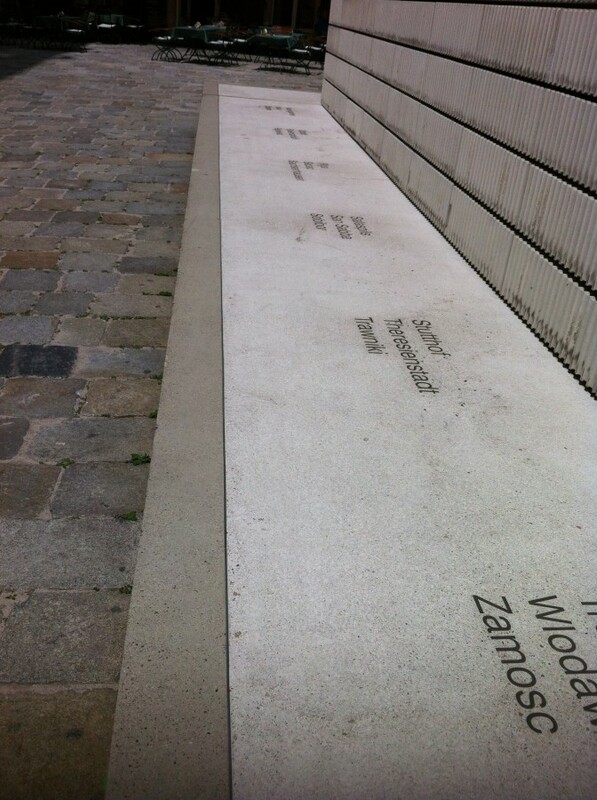 But looking back at the Holocaust memorial in Vienna’s Judenplatz, how prescient is that line! And the book burnings haven’t stopped, as a Wikipedia article eloquently shows. Previous Previous post: LIME GREEN? SPRING BUD MAYBE?